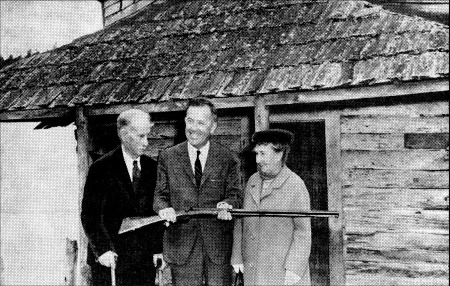 Caption: "Senator Henry Jackson examined Cutlar's shotgun with Crook and Mrs. Rhoda Anderson." Scoop needs no introduction, but we hope a reader can identify the two other people. See the follow-up story about Cutlar and his ranch near Blanchard in this new story from Issue 57 of the Online Subscribers-paid magazine. On Jun 15, 1859, Cutler became displeased with a Hudson's Bay Company pig rooting in his potato patch and fired the shot with this shotgun that eventually precipitated us into ownership of the beautiful San Juan Island group. The catalyst was a burst of temper and the only casualty was one pig. To anyone interested in ordinance statistics: Cutler's shotgun is a muzzleloader, double barreled, 10-gauge fowling piece with twist barrels 30 inches long. It operates on the percussion principle, that is, it uses percussion caps instead of a flint to touch off the powder charge. I was surprised at the neat appearance of this gun which reflects the advanced design and workmanship of English gun makers, or others, at such an early date. It was in use in 1859, but there is no telling how much earlier it was made. The stock shows excellent woodworking skill and the sleek lines of the weapon gives the impression that it is no larger than a 12 gauge. Except for the old fashioned hammers and twist barrels it compares favorably with many of the modern doubles being sold today. According to Cutler's estate probate records, this gun listed as "1 Double baril Shot Gun" appraised at $25, was purchased by D.F. Thomas of Edison for $14 at the sale of Cutler's personal property held at his claim in the Samish Valley on June 13, 1874. The weapon was in the possession of the Thomas family until 1927 when it was presented to the State Museum, according to museum records. If this shooting iron could talk, what tales it could tell! Our introduction to a multi-part section about the almost-Pig War of 1859 on San Juan island between the United States and England, which never happened but is often celebrated and argued. Includes overview from a Pig War book, background and links to many other sources. This story will soon be changed to this address. If neither file connects, please email us.